In honor of Mother's Day, the Oakland Urban Paths walk on Saturday trekked through Oakland and Piedmont, and included a stop in the Morcom Rose Garden where celebrations for the Oakland Mother of the Year Award were going on. About 35 people and 5 dogs joined us for an unexpectedly warm walk on stairways in Lakeshore, Grand Lake, and Piedmont. We met in Mandana Plaza to begin the walk, then headed up Lakeshore Avenue. 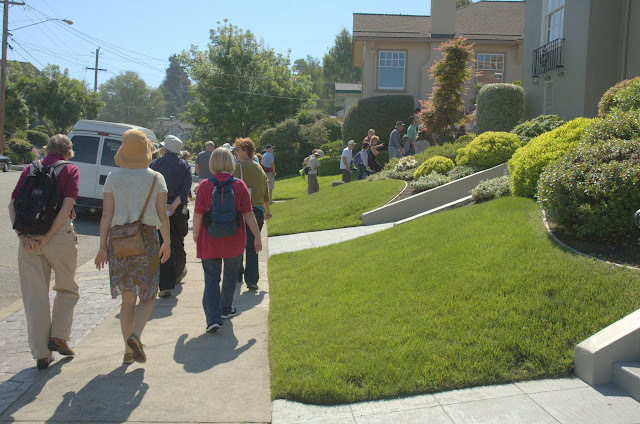 At our first stairway, Paul talked about the Key System and how many of the stairways and pathways around Oakland were built to give people in the neighborhoods better access to the streetcars. The different lines of the Key System were assigned letters and unique symbols so that riders could see which train was coming from a distance. I pointed out a cast-iron lamp on the stairway which has a lot of history in a little stamp near the base. The lamp was made by the Joshua Hendy Iron Works. The company was originally based in San Francisco and later Sunnyvale. They manufactured mining equipment, valves and control gates for such projects as Hoover Dam, but were probably best known for manufacturing marine engines for hundreds of Liberty ships during WWII. Our wanderings took us up and down more stairs, past lots of gardens, flowers and lovely homes, and eventually into Piedmont. And then right back into Oakland. In an OUP first, we got to tour one of the gardens, thanks to Tim and Chris (who is on the Walk Oakland Bike Oakland board). They graciously invited us in to see their garden, which is full of native plants with a particular eye to attracting wild bees. Their cat was understandably less pleased about the presence of the dogs in our group. Tim didn't have time to talk about it while we were there, but the garden also features a gray water system as well as a barrel for rainwater collection. Then it was back into Piedmont, and time for some confusion. When I tested the walk route, I didn't go through Tim and Chris' yard, but took a slightly different route around to the next point. As a result, I wasn't able to help when there were doubts about where to go on the route next. Things got more interesting because I got my bearings and proceeded to tell some people where the correct route was, and that while most of the group had backtracked a bit, we'd meet up shortly. So, about that... We backtracked further than I'd expected, so we didn't rejoin the people I'd directed down the correct route. After a bit of running around, I found the sub-group and lead them on to the rose garden where we rejoined the main group. 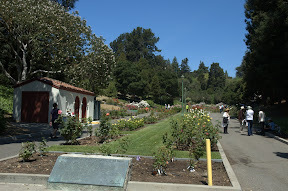 At the Morcom Rose Garden there were ceremonies for the Oakland Mother of the Year Award. It's been given annually since 1954, to honor people in the community who "symbolize the finest traditions of 'motherhood'." This year's winner is Annalee Allen, who writes a history column for the Oakland Tribune and also leads the city of Oakland's downtown walking tours program. I ran into lots of folks from the Oakland Heritage Alliance who were there to celebrate Annalee's award, as well as Robert Raburn of the BART board. Mayor Jean Quan and councilmember Lynette Gibson McElhaney were there, too. After we left the rose garden, we climbed up Jean Street so we could descend some stairs down to Grand Avenue. After crossing Grand, we admired the mural at the foot of the Davidson stairs, then climbed up the stairs to Vernon Street. There we viewed the back of the Grand Lake Theater sign, and Paul told us a bit about that. The sign has 2,800 colored bulbs, and is the largest rotary contact sign west of the Mississippi. The light sequence is controlled by a device not unlike a music box. Then we descended back to our starting point on Lakeshore Avenue. 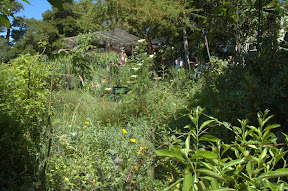 Another great walk—thanks to Paul for leading it, and to Tim and Chris for letting us tour their garden. And thanks to everyone and everywoof who came out for the walk. The next walk will be Saturday, June 8th at 10am. The walk is still being finalized, but will likely be along the waterfront. Hope to see you out there!